I made it to the theater just in time. As the clerk handed me my ticket, she said, “There may only be two or three seats towards the front.” So I sat down in the front row, made myself comfortable and uncapped my pen. If you see the film anytime soon, count on finding me in the same spot. 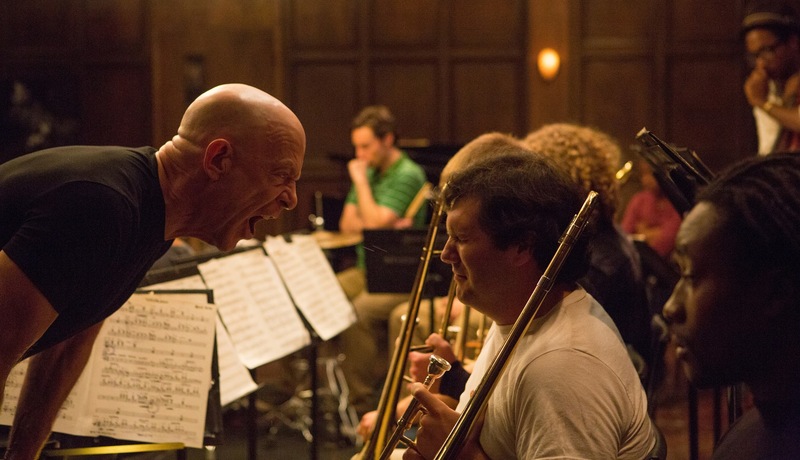 Whiplash is a blood-boiling film best experienced up close. The film opens with a black screen. We hear a drummer hit a snare repeatedly: slowly at first, then faster and faster until the sound builds to a deafening roar. The drummer maintains this furious pace for a few agonizing moments. He stops with a final slam that echoes as the next shot reveals him in a practice room at the end of an eerie green hall. 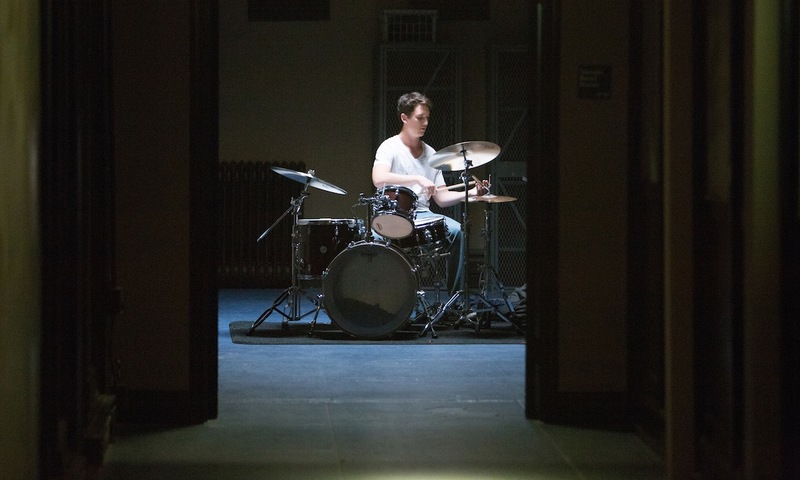 This is Andrew Neiman (Miles Teller), a first-year at Shaffer Conservatory, the best (fictional) music school in the country. The camera hesitates for a moment. It then creeps towards Andrew, floating steadily through space. 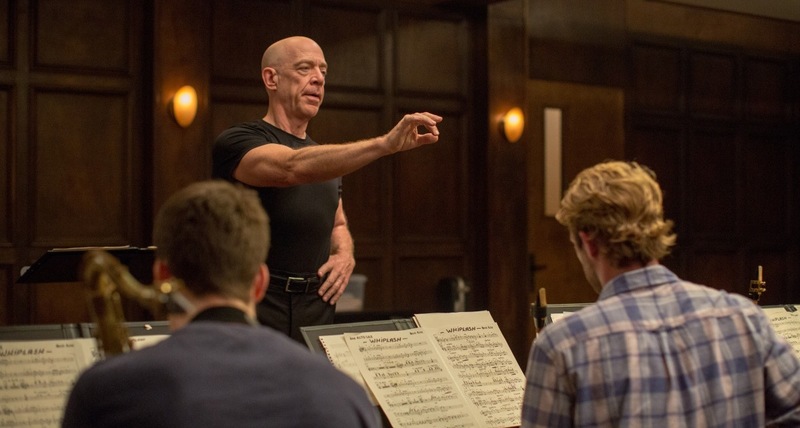 When these curious eyes reach the doorway, the camera cuts away to reveal who they belong to: Terence Fletcher (J.K. Simmons), conductor of Shaffer’s ultra-competitive studio jazz orchestra. Fletcher asks Andrew why he stopped playing. So Andrew starts playing again. Fletcher asks Andrew why he started playing again instead of answering the question. Andrew apologizes and Fletcher quickly asks to see his “rudiments.” Andrew starts to demonstrate, and the camera cuts back to the door slamming behind Fletcher as he leaves. Andrew slumps back in disappointment. Then Fletcher bursts into the room again and Andrew jolts back up – but Fletcher is only back to grab his jacket. He leaves again with a cheerful smirk. This brief scene establishes an iron-taut tension that pervades the entire film. Fletcher sees potential in Andrew and quickly accepts him into his band as an alternate. A sinister dynamic becomes clear at the first rehearsal. The band jumps to attention when Fletcher enters the room. He’s a clean-shaven and muscular presence onscreen. Fletcher is a master of jazz and emotional manipulation. He stops at nothing to push his students to their potential. Blood, sweat and tears are literal requirements in his company. 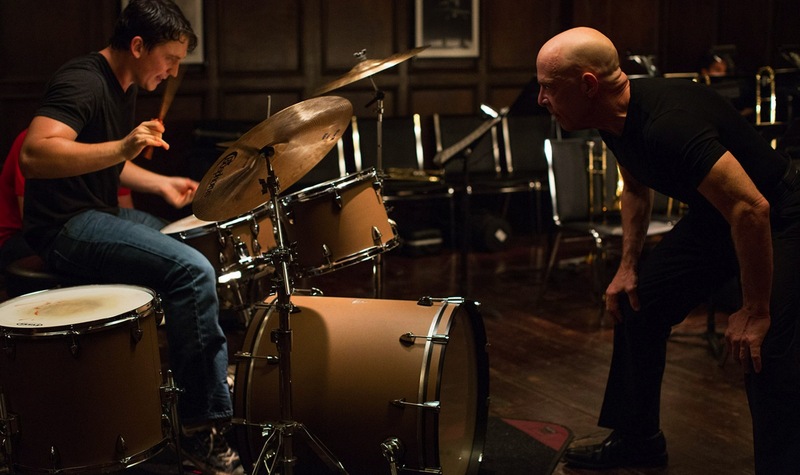 Whiplash is a duel between student and teacher. Andrew shows promise and is determined to the point of desperation. Fletcher is an unwavering titan in his domain, capable of cutting down anyone with a single word. The costars enliven the warring wills of their characters. Simmons aggressively throws himself into the role. Veins bulge in his temples and arms as he screams, slaps and throws metal chairs at his students. Meanwhile, Teller affectingly inhabits Andrew’s anxious-to-please attitude. His ambition collapses into exhaustion, his boyish charm into depression. He makes Andrew’s psychological chaos the film’s affecting core. 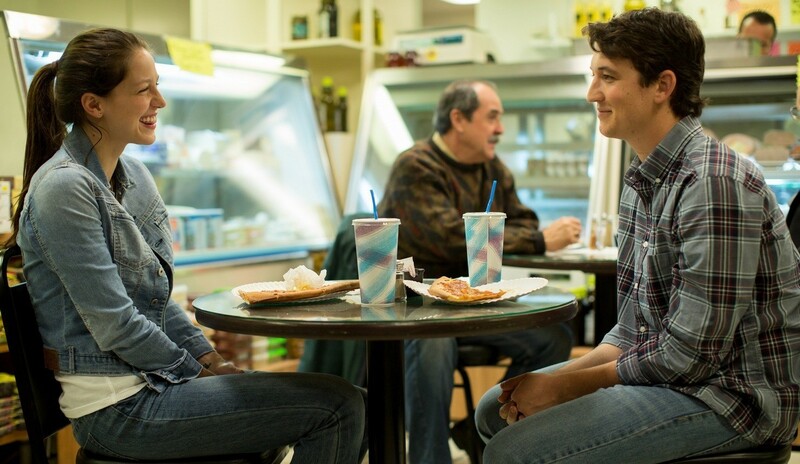 Although the film is obviously a vehicle for its leads, the underwritten supporting roles are still a drag. Andrew’s girlfriend, Nicole (Melissa Benoist), is dismissed almost as quickly as she’s introduced. She barely speaks beyond some playful banter and one brief, pained monologue. Nicole is the only female character with somewhat memorable lines. And, maddeningly, she exists for no purpose other than to underline Andrew’s deteriorating head space. Chazelle discards her humanity so she can become just one more thing weighing on Andrew’s conscience. Chazelle’s dialogue, like a good jazz piece, is snappy and surprising. Every scene between Andrew and Fletcher kicked my heart rate up a few notches. Their interactions constantly threaten to explode. The pressure of the cutthroat conservatory environment is disturbingly clear. Fletcher wields profanity like a knife, and band members toss vicious insults about each other’s musical abilities like spiked barbs. This friction continues outside the classroom. A family dinner breaks down into a verbal sparring match as Andrew and his relatives deflect each other’s diminishing remarks about their achievements. Andrew’s cousins disparage his devotion to music as he mocks their commitment to division-three football. Andrew’s uncle asserts that he’d rather have friends than follow the live-fast-die-young path of a musician. Andrew wants to be one of the jazz drumming greats, and he grows increasingly pragmatic as he stalks toward that goal. Chazelle and cinematographer Sharone Meir frame the character in close shots, showing how the pursuit of perfection wears on him. Odd blue-green lighting emphasizes the paleness of his face. Bags hang under his sullen eyes. Sweat soaks through his shirt. Composer Justin Hurwitz buries music and background noise under a low unnerving hum as we watch Andrew practice until he tears his hands apart. Whiplash switches between calm and storm with little warning. These shifts are disorienting but engaging. I never dared look away from the screen. Chazelle, Teller and Simmons held me captivated, and I felt terrified waiting for each turn in the narrative. As the thrilling finale cut to black, I took a deep breath. My heart had relaxed, but my mind hadn’t. I’d become addicted to the rush.